JPlaton technology is an integrated environment designed to develop and run multi-developer, multi-customer, multi-user, multi-session, and multi-device open applications for the Cloud. 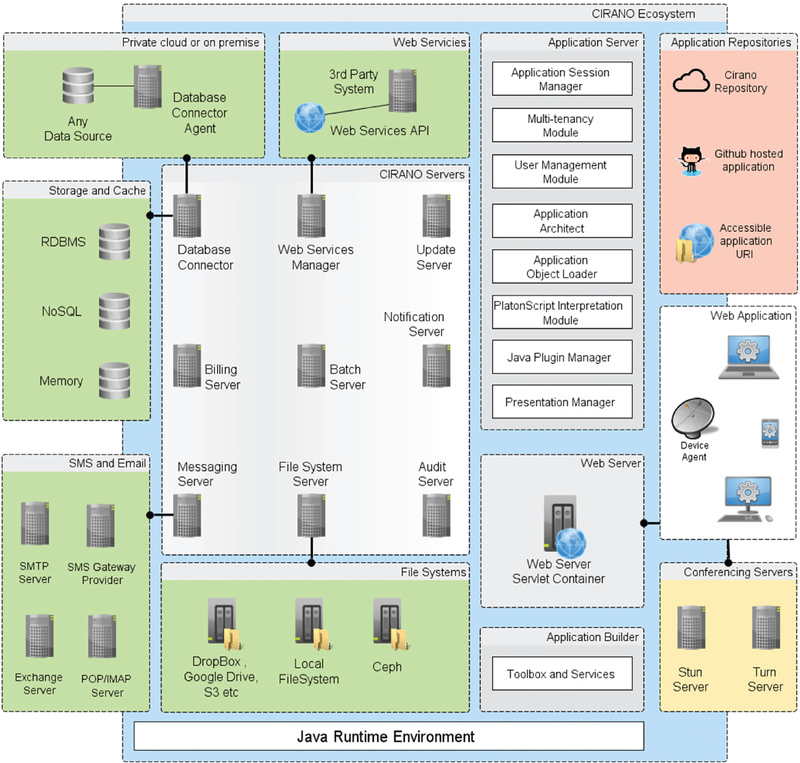 The jPlaton Application Server handles the requests from the Web server, creates the application environment as well as the user sessions, connects the application to the Database Server, allocates resources to user requests and assembles every program unit from the respective XML files. The jPlaton Database and File Server connects the application to a data source no-matter its location, vendor or type. It provides connectivity with Relational, NoSQL and Memory databases as well as with local and remote file systems and other third-party file system services. The jPlaton MVC Module transforms the models from the Application Server into operational objects and runs the application logic executing Java or PlatonScript commands. The User tier may be a PC with the jPlaton Client, or a browser or a mobile or any smart device that can be connected to the system via HTTP, Web services or TCP connection. jPlaton offers all the necessary tools in one platform that are needed to design, develop and run the application, isolating the developer from infrastructure technologies and application environments, maximizing the productivity and providing an integrated, uniform, open and collaborative environment which allows the implementation and upgrade of large software projects by small development teams. The completely open and transparent architecture permits the flow of know-how among the implementation layers, facilitating integration, while the distributed multi-layered architecture enables the evolution of the product, while at the same time preserving the simplicity and reliability of the inner (core) layers.